For the past 20 years, travel has continually evolved. As flights, hotels, and travel experiences have become more accessible through the internet, old-school travel agents have become less needed. In their place is the evolved travel agent—the travel advisor. But what makes a travel advisor different than an agent and why do you need one? Let’s discuss. In the past, travel agents were “agents” for the airlines and hotels, since consumers couldn’t book travel on their own. They answered calls, booked the trips their clients requested, and essentially served as order-takers. Travel advisors are the evolved version of the travel agent. With the rise of the internet, consumers have almost too much information on the internet. For example, when you Google “Mexico vacation,” you get 328,000,000 results. Who has time to wade through all of that? Travel advisors give you the information you need while saving one of your most valuable resources—time! Doing basic travel research like browsing online travel reviews can take hours. Save time and get the expert advice you need with a travel advisor. 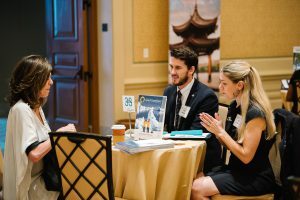 A travel advisor is well-traveled and has key contacts and resources in the industry to make the perfect recommendation for their clients. Through their years of first-hand experience and knowledge, they have improved the travel-planning process by figuring out methods of personalizing the experience for each of their clients. One of the common myths about travel advisors is that using one makes your trip more expensive. This isn’t true. Actually, using a travel advisor gets you a better price on nearly every booking! Many travel advisors do charge trip-planning fees, since many travel suppliers no longer pay commission. But, getting expert knowledge on your behalf is worth the additional cost. Imagine using a financial advisor without paying them. It doesn’t make sense. A travel advisor does essentially the same thing, including saving you money on your expenses. · Travel advisors work directly with a hotel’s executive team (whom they often have a personal relationship with!) to personalize your stay. Consumers are all about authentic experiences and extras these days. A travel advisor takes your experience even further by handling your show tickets and restaurant reservations. · Through preferred vendor relationships, most travel advisors can get their clients complimentary perks such as room upgrades, cruise line onboard ship credits, breakfast, wi-fi, early check-in and more. · Advisors know their clients on a personal level so that they can continually suggest new and exciting vacation destinations that fit their preferences. · Travel advisors use personal contacts to make reservations that aren’t available online or through typical booking systems. · Hotels and airlines give travel advisors first-dibs on some of the best travel products and experiences throughout the world. All in all, travel advisors personalize travel to fit you, rather than fit you into travel. It’s these changes that really take travel to the next level. As a network of independent travel advisors, we focus on creating a greater experience for our clients.